This jacket is an example of the uniforms that were not prescribed by regulations but where commonly worn in the field. Infantry colonels were mounted and a short jacket such as this is more comfortable on horseback than the longer skirted regulation frock coat. Many period photographs show jackets similar to this being worn even by company grade officers who would have been on foot. An outstanding feature of the jacket is that it has silver eagles sewn on the shoulders and not shoulder straps. This is consistent with General Orders 286 of November 22, 1864, which permitted officers to dispense with shoulder straps and wear only their "marks of rank" on the shoulders. Other features also convey the officer's rank. It is double breasted, a feature that indicates a field grade officer and the sleeves have sleeve braid of five black braid strands consistent with the pattern worn on the regulation officer's overcoat by colonels. 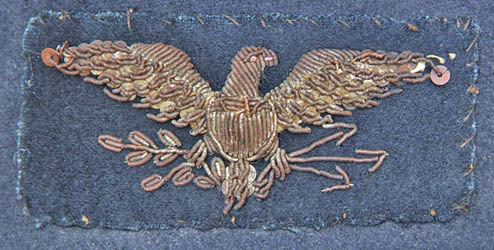 Other features of the uniform includes infantry officer's buttons, which have a "I" in the eagle's shield and the three cuff buttons characteristic of period officer's uniforms (enlisted men typically had two). Lastly, on the back of the jacket is a pair of bolsters similar to what appeared on mounted enlisted jackets. These were designed to keep to bottom of the jacket from riding up over the sword belt. 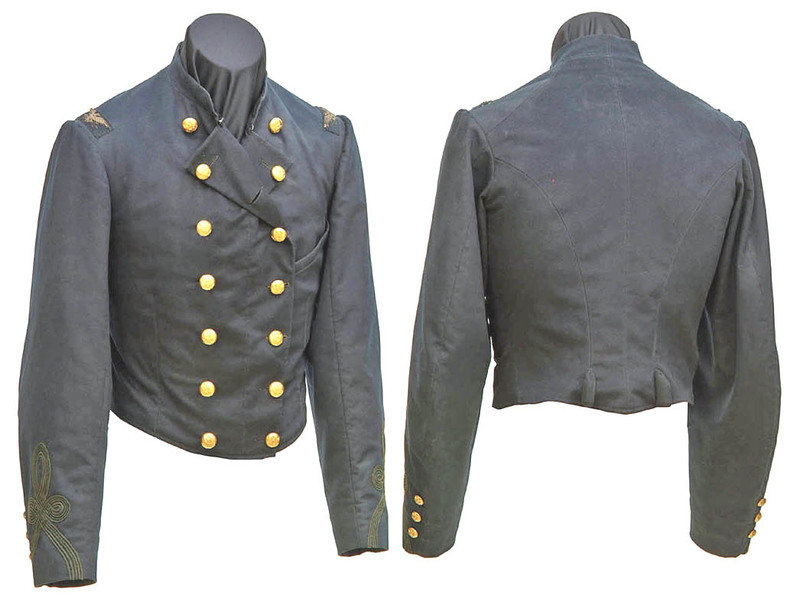 This jacket belonged to Winsor B. French, commander of the 77th New York Infantry Regiment. The name is written inside of the jacket. It is interesting that French appears in most records as a lieutenant colonel, but on September 5, 1863 he did receive a commission from the governor of the state of New York as a full colonel. However, he was never, for whatever reason, mustered into U.S. service as a full colonel. He also received a brevet as brigadier general for his service.